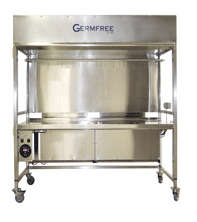 Germfree’s Pharmacy Division manufactures a comprehensive line of equipment for health-system pharmacies and other facilities that compound sterile and hazardous drugs. Our all stainless steel units are optimal for the cleanroom. We provide USP 797/800 and NIOSH compliant Compounding Aseptic Isolators, Biological Safety Cabinets, Laminar Airflow Workstations, Radiopharmacy Equipment and Powder Containment Enclosures. We also offer turnkey USP 797/800 Rental Compounding Cleanroom Pharmacies, ideal for facility renovations. Established in 1962, Germfree has been protecting patients and pharmacists for 55 years. 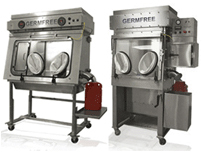 Germfree's Laminar Flow Glovebox/Isolator (LFGI) Series is USP 797/800 and NIOSH compliant. These units were developed for superior product, patient and personnel protection. An advanced ergonomic design ensures maximum user comfort. The units can operate under positive or negative pressure. Germfree's VersaFlow Series is the most practical solution to USP 797/800 compliance for hospital pharmacy and cleanroom environments and is ideal for TPN auto-compounders. Germfree offers a complete line of shielded isolators and biosafety cabinets to provide advanced product and personnel protection while compounding sterile radiopharmaceuticals. Our LFGI Series provides lead-shielded Compounding Aseptic Containment Isolators. Our RADIOSAFE Series offers lead-shielded Class II, Type A, Biological Safety Cabinets. 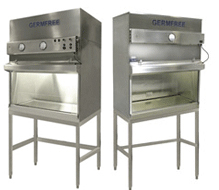 Germfree’s radiopharmacy systems are constructed of stainless steel and designed for USP 797/800 compliance. 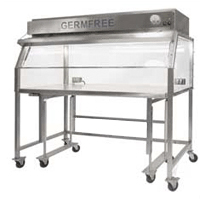 Germfree's Class II, Laminar Flow Biological Safety Cabinets combine product, operator and environmental protection. These Biosafety Cabinets, also referred to as 'Chemo Hoods', are designed for the safe handling of cytotoxic agents and other hazardous drugs in pharmacy and oncology settings as well as in other compounding operations. Germfree's wide range of Class II cabinetry is used to work with low to moderate risk materials and to provide a sterile working environment. These Biological Safety Cabinets eliminate cross-contamination or the release of carcinogenic aerosols and drugs to the outside environment. Germfree's Compounding Safety Enclosures (CSE) provide the operator with maximum protection while weighing and transferring non-sterile powders and compounds. The CSE's filtration system handles particulate laden air and directs it away from the user. Large hinged windows provide ample clearance for equipment entry. The stainless steel surfaces inside the hood are impervious to most chemicals and are easily cleaned.